Boy Scout Troop 33 in DeKalb held an educational overnight at Bartlett Nature Center, which is located at James “Pate” Phillip State Park. Scouts enjoyed a variety of programs through educational displays, live animal exhibits, a theater for movies and video games, area for board games, plus outdoor adventure with campfire and nature trail. Most impressive was a hands-on experience with a 15-foot, 150 pound, Burmese Python named Max. 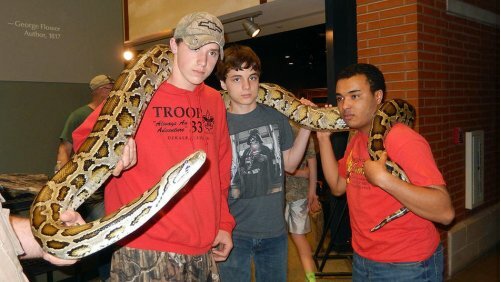 Pictured (from let) are Tim Schlick, Noah Larsen and Travis deOliveira holding the python.